In the second ‘Hot Heritage Abroad’ this year, I compare Spain’s biggest seaside city, Barcelona, with England’s most exciting seaside resort, Brighton. The general plan was to fly out, stay two nights, see as many as buildings as possible then fly back. I felt that I was off to a good start after booking £100 flights (return) from Gatwick and a £58 per night double room (3*) over the internet. Things started to go wrong when we arrived at the hotel only to be told that our room was not available as the air-conditioning was being fixed. A free upgrade to a nearby 4* soon sorted that. I’ve always loved the song ‘Barcelona’, sung by Freddie Mercury & Monserrat Caballe, so it was great to finally see ‘such a beautiful horizon’. The city’s greatest asset and most visible building as viewed from the surrounding hills is certainly La Sagrada Familia. The inspiration for the building came from Pope Pius IX’s call for a renewal of devotion to Jesus, Mary and Joseph – the Holy Family or La Sagrada Familia. The church’s first stone was laid in 1882 but was redesigned in 1884 after Antoni Gaudi stepped in to take over the project. 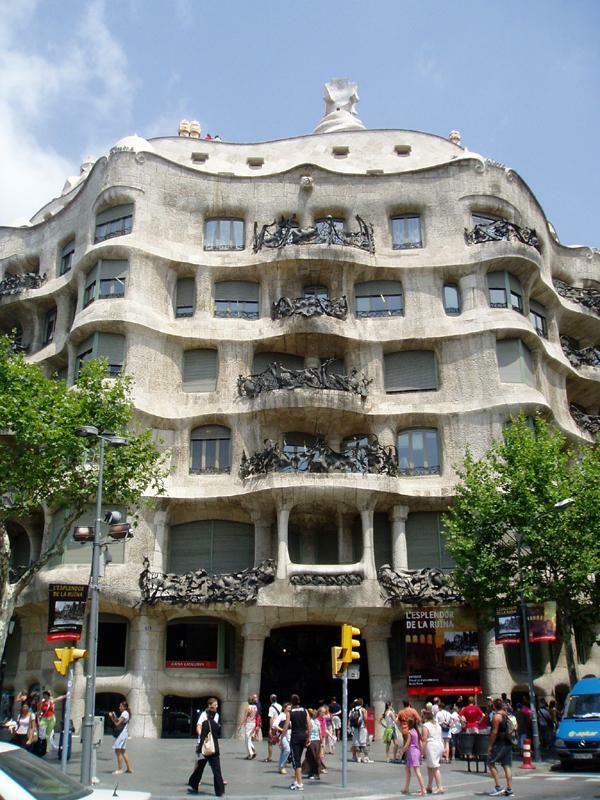 Like many of Gaudi’s buildings, its structural and aesthetic features are influenced by nature. Its principle features are the various facades, cavernous interior (to seat 13,000) and eight towers, 100m high. After taking over the project, Gaudi became obsessed with religion. He was so ragged and poor when he died after being run over by a tram that initially no-one recognised him. There are still nine more 100m towers and a central 170m tower to be added along with the grand entrance façade. Both Brighton and Barcelona are blessed with a wealth of historic buildings. Both are surrounded by sea and hills though the scenery around Barcelona is certainly not green. It’s not until going abroad that one appreciates the beauty of the English countryside. Both are soulful, exciting, vibrant, compact and friendly. Sadly, both (in places) are dirty and smelly. Brighton obviously has the superior football team. Barcelona has a population of 1.6 million, so it is perhaps really an unfair comparison though there are many similarities. Exciting projects are on the go in both places such as La Sagrada Familia, which just might be finished by 2040. And we complain that the West Pier is taking ages!